To say that Red Dead Redemption 2 is one of the most eagerly awaited video games of all time would be somewhat of an understatement and with only around four weeks to go until we get our hands on it we really are heading into the home straight. And that means that Rockstar are going to be more generous with what they’re going to give away about it and they’ve just decided to drop another four minutes of actual gameplay onto YouTube. 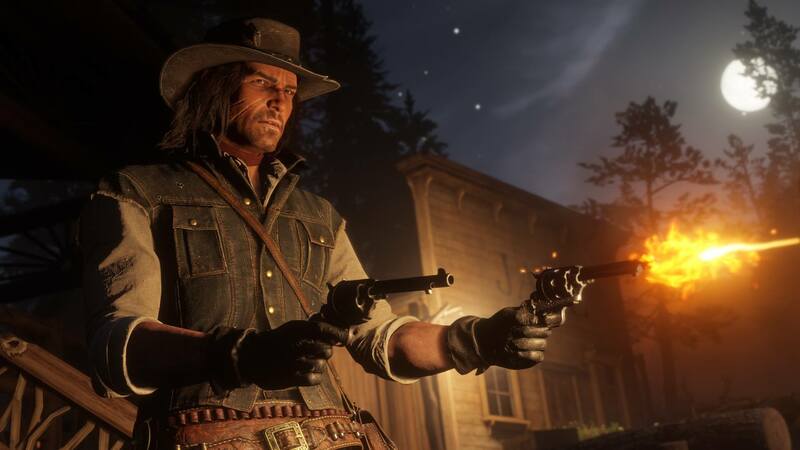 In this video you’ll see some of the activities that Arthur and the Van Der Linde Gang get up to throughout the course of the game. Watch the second half of our Red Dead Redemption 2 Gameplay Series – outlining all sorts of nefarious activities Arthur and the Van der Linde Gang can get involved in, including robbing trains, encountering rival gangs and outlaws, evading cunning lawmen and lots more in a world that is deep, teeming with life and very menacing. Today’s video also includes a look at the new and expanded Dead Eye system, and was captured entirely from in-game footage. I mean yeah if you watched that video and didn’t get blown away by the graphics and all the completely sick stuff that it looks like you can do – in particular all the stuff with the trains – then I guess there’s no joy in your soul or video games just aren’t for you. Either way, I’m excited and can’t wait to finally get my hands on this. Only a couple more weeks to wait. To get even more hyped, check out all the stuff we already know about Red Dead Redemption 2 here. It’s going to be so epic.